The question. A big storage tank, partially full of slightly salty water, is perpetually leaking into the ground at the rate of 10,000 gallons per day. To compensate for this pure water is steadily added to the tank at the rate of 10,000 gallons per day. An inspection found that the tank contains 10,000 gallons and 1 lb of salt; the inspection also found that the conditions in the tank are keeping the tank thoroughly stirred. How much salt is there in the tank a day after the inspection? The other main conjectures are that there will be some very small amount of salt left after one day, or that there will be 1/2 lb of salt left after one day. One idea is to try to simplify the problem. One possible simplification is to try working with 1 gallon of water, instead of 10,000 which is cumbersome. Pretend that the day passed all at once in 1/2 day chunks, then 1/3 day chunks, etc. A formula for how that happened in a general case was offered. The joke was that it was a very “simple” formula but it was actually quite complicated. We worked for a while trying to connect this to last week’s formula. Then, [(n-1)/n]^n was simplified to: [1 – 1/n]^n and there was a definite aha! moment when others saw that this meant 1/n amount of salt left in each 1/n chunk of time. Someone also noted that when you set n = 10,000,000 then the formula equals 0.367 which was thought to be 1/e. Nobody really knew what e was. At the very end, we started looking at the second problem, with 50,000 gallons………. Our goal was to figure out divisibility rules and to understand them. The kids listed them in the order that they wanted to solve them. They decided: 2, 4, 8, 3, 6, 9, 7. Later they changed this to 2, 4, 8, 3, 6, 9, 11, 7 by adding 11. They knew rules for 2, 4, 8 so we focused on why they work. Using 8 as an example, they showed that 1000/8=250 and any multiple of 1000, say a*1000, would be divisible by 8 to get a*250. So we just need to look at the last three digits. They were happy with dividing by 2 three times to test so we left that there. I’ll note here that I deliberately did not review division rules before this class because I wanted to be enmeshed in it with them. I can’t participate verbally of course, but it is fun to tag along mentally. So, I don’t know if there is a cool way to look at the last three digits and check divisibility by 8 or not. Any kids out there have any ideas? That brings us to divisibility by 3. They did not know a rule for 3. First they tried to figure it out by just thinking and talking. After awhile I commented that sometimes I look at examples when I am stuck. They made two or three examples. A bit later I commented that there weren’t very many examples on the white board. They generated a bunch more examples then, “look!” one of them said, “the sum of the digits is divisible by 3.” Probably. They moved to why. More digging around then this: 10/3 has remainder 1, 100/3 has remainder 1, 1000/3 has remainder 1, and so on. A bit more of the same process and they realized that: 10/9 has remainder 1, 100/9 has remainder 1 and so on. From there, it was a very quick proof that the sum of the digits needs to sum to 9. For 6, they were happy with using both the rules for 2 and then 3. I did push a bit here. I know that is the classic rule but I couldn’t help wondering if there was something that combined the two. They did point out that the rules for 2 and 3 were different kinds of rules. So, they went on. That was near the end of our time but one of the kids remembered a rule for divisibility by 11 that sounded really weird so we added that to our list. I helped here by saying that figuring out 7 was going to take all the tools we could develop, so we put 11 before 7 on our list. They all got up to leave and someone said that they thought there were an infinite number of primes, quickly followed by, “I think I can prove that.” Everyone agreed that there were probably infinitely many primes. So, I added that to our list of possible things to do and we called it a day. 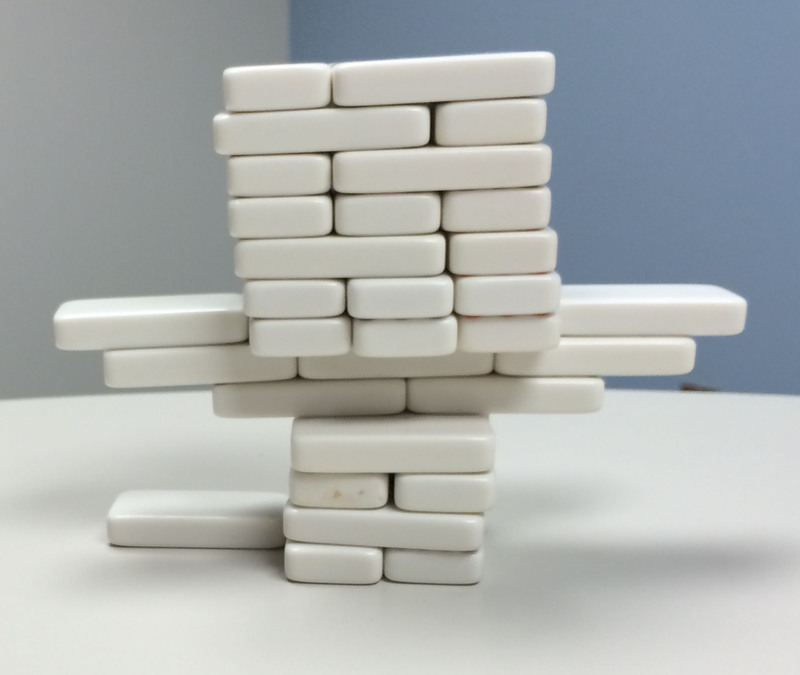 Our question was: How big of an overhang is possible when stacking dominoes? We have not yet stated any rules so both options are valid. At some point no one had complained about my dominoes (which are very imperfect) so I asked them to think about what a perfect domino is while they were building. One of them said loudly, “Sticky!’ Which would, of course, be great! We have overhangs of 0.80 with Stairs and almost 2 with Toy Swords. With 20 minutes to go we put the dominoes away so we could focus on what we we noticed. We have two conjectures. 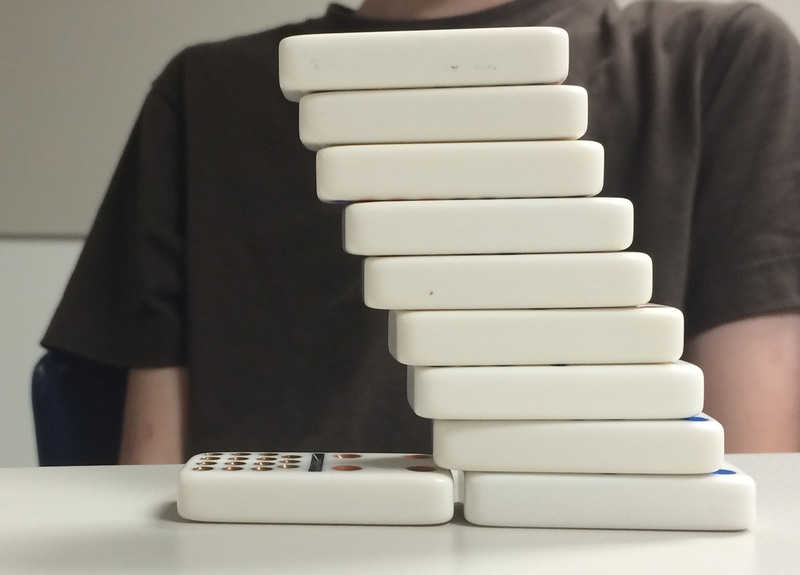 The first conjecture is that with really good dominoes we can get an overhang of two dominoes (note that “overhang” is still undefined but they are all using the same intuitive definition) with Toy Sword. The second conjecture is that we could get infinitely close to an overhang of one domino with Stairs. They gave a beautiful explanation of how, using one perfect (“perfect” only partially defined) domino as a base, one can get an overhang of infinitely close to 1/2 with a second domino (first non-base domino). How many solutions are there to the 3×3 Magic Square? For two sessions we explored the numerical solutions and then looked at symmetries and discussed whether or not symmetrical solutions were the same or not.